Getting Out of the Way of Development » Core Parenting - Parenting Resources in Portland, Oregon. My three-year-old asked if the boys could play with chalk and draw on the chalk wall that is in our kitchen, his younger brother bounced up and down, pointing at the chalk wall in excitement. Sure, it seemed like a great idea for a soggy morning. I brought out the box of chalk and the two of them went at it. I sat and watched them for a minute and relished in the vision of the two of them, drawing side by side. I held back from commenting on their activity or getting involved, impressed with the moments that they play and interact together so comfortably. I ventured out of the kitchen and thought about my to-do list. I wondered if their activity would last long enough for me to clean the bathroom. I started with something simple and swept the bathroom floor. The house was quiet. I tiptoed into the kitchen and peeked around the corner. Still working. I saw my three-year-old tell his younger brother, “It’s a space ship,” and my younger son smiled and nodded. I went back to the bathroom. Not trusting fully in the longevity of what was happening, I cautiously pulled out the cleaning products, sure they would bound down the hallway at any moment. I took a deep breath and told myself to stop wasting time. I started cleaning. Alone, in the bathroom. I checked on them several times, sure that I would find them in some precarious position, climbing countertops, eating chalk, smothering each other in some dangerous way. But each time, I found them in unbelievably cooperative play, creating a work of art. It was too good to be true. I left them to it and continued my chores. I finished the bathroom and moved on to my bedroom. This was amazing. It couldn’t last. The house was quiet. I ventured out one more time to the kitchen, and there it was. I just knew it. 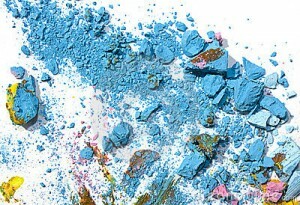 The boys had developed a method for turning the chalk into powder and were diligently working together to cover the entire kitchen floor with a rainbow of fine powdery color. Green, red, purple, white, and orange dust blanketed the floor and covered them from head to toe. I froze and felt my breath catch in my throat. My immediate reaction was to intervene and put a stop to what was no less than a messy disaster, but something stopped me. Perhaps it was the knowledge that the moment I intervened would be the end of my relative freedom to finish my chores. Perhaps it was an understanding that my intervention would also put an end to the cooperation and brotherly bonding that was going on. I took inventory and realized that the mess they were creating was a done deal and I made a conscious choice to “look the other way” and finish my tasks before tackling theirs. The boys noticed me standing there and squealed with delight, “Look, Mama, we are making moon dust! We put footprints in it that will be there forever!” They stomped around the kitchen in their moon dust, proudly laughing and giggling as the chalk dust rose in the air. “Looks like fun,” I said and walked away. I went back to my chores, trying to ignore the mess I was eventually going to have to address, and trying to hold on to the last few moments of precious peace I would have for the day. And then, perhaps because I had left them to their own devices, left them to negotiate and explore the world on their own without my help, they shocked me one more time. About 10 minutes later, I heard them getting into the towel closet. Worried that the chalk was going to infiltrate the entire house, I went out, prepared to put an end to this disaster once and for all and set the motherly foot down. I nodded and left them alone. A few minutes later, I went to the kitchen and found them both spreading watery towels on the kitchen floor, pushing wet chalk around. I asked if they needed help and they agreed. Together we cleaned up their chalk. They were so proud of their creation and seemed even prouder of their decision to clean up when they were done. I wondered to myself what happened. I had trusted them to explore the world on their own. I had let them push the boundaries of what is normal and comfortable and refrained from engaging in any way, even to praise or encourage them. I had just let them be. While I would love to profess that I did this for some developmentally-driven, well thought out reasoning, the truth is that I simply did it because I was feeling a little bit selfish and enjoying my own moment of peace. But, a miraculous thing happened. The boys created their own moment, experienced the world in their own way, flourished in their own imaginations, and showed a level of responsibility and awareness of the boundaries of the world that I never imagined they had in cleaning up after themselves. I never could have created all that if I had tried to formulate an experience or designated myself as the leader of their activity. They only really got all of that because they had the freedom and the space to start a task and see it through to the finish without me getting in the way. And I got a little time to myself. I wonder how often I intervene when I don’t have to. How often do I step in when situations get a little uncomfortable for me and, in doing so, limit my children’s experiences of the world? There are, of course, times when we must step in and guide our children away from danger. And there are many times when we have to guide our children to do certain things because things need to get done, we have places to go and things to do. But oftentimes, we are guiding them away from experiences not because anything drastic is going to happen or out of any kind of necessity, but merely because their way is messy or inconvenient or different from how we imagined it would be. While difficult to do in the moment, I believe strongly that allowing children space to experience the world on their own terms is crucial at every stage of development. It allows them to develop a sense of who they are in the world, allows them ownership over their thoughts and ideas and experiences. The chalk was their moon dust… The mess was their mess. For toddlers, freedom happens in safe spaces like this. As children get older, parents have to expand the area and offer bigger and bigger opportunities for freedom. This means parenting may be a little less comfortable at times as we give up control. But it may also mean that we have a little more room to breathe and a little more room to grow. Sometimes, we need to get out of the way of our children’s development. Am looking forward to catching up on old blogs and will be eagerly awaiting new ones=) Thank You!